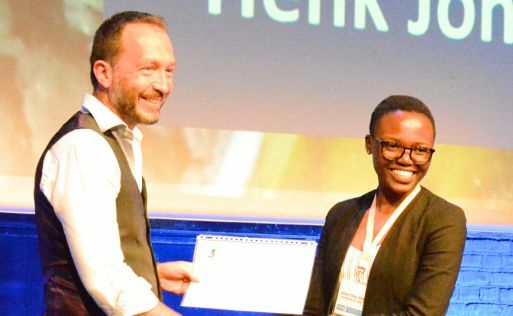 Ms Alice Titus Bakera, a PhD student in CoMSIRU, a research unit in the Department of Civil Engineering, received the 2018 RILEM Best Student Poster Award for her work on "Durability Properties of Concrete Containing Metakaolin”. Emeritus Professor Mark Alexander supervises Alice. The award was made at the RILEM Annual Week conference which was held in Delft, Netherlands. RILEM is an international organisation concerned with research in materials and structures and has been in existence since 1947 with its headquarters in Paris. In 2012, Emeritus Professor Mark Alexander was the first African president of RILEM. The conference’s theme was Service Life Design for Infrastructures, and was jointly organised by Delft University of Technology, and the Tongji University in Shanghai. Alice received the award from Nicolas Roussel, RILEM TAC Chair at the General Council on Wednesday 29 August 2018.